Tourismo range is already the best-selling touring coach in Europe, with a market share of around 20%. Some 2,097 were built in 2016 and a total of over 26,000 have left the factory since the first coach to carry the Tourismo name was announced 23 years ago. For two years, the UK has embraced the model for all the right reasons. Describing the Tourismo as ‘the most successful European touring coach of all time and a key driver for the success of Daimler Buses’, Head of Daimler Buses, Hartmut Schick, said the new Tourismo is now even more economical, comfortable and safe. Developed at a cost of €400m, it looks set to reduce costs for operators through increased fuel economy, optimised service intervals, new features and increased passenger appeal. 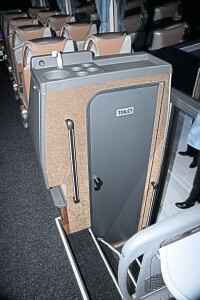 It also claims to be ‘the safest touring coach in its category’. In addition to serving the niches it already aims at, the scope of the range is being extended upwards to cover the sector currently addressed by the Travego; the flagship coach for the three-pointed star. There will still be a Euro 6 model called Travego, but this super-high design, launched last year, is to be offered only in Turkey. In Europe, where demand for premium touring coaches is less strong than it once was, those who want to buy a Daimler Buses super-high coach should be amply served by the Setra range, although this will continue to be unavailable to UK and Irish customers. For the launch of the new model, Mercedes-Benz chose a location at the very heart of Europe, within Brussels’ 1930 art deco exhibition hall which overlooks the gleaming metallic globes of the iconic Atomium, built for the 1958 World’s Fair. The Tourismo story goes back to 1994 when Mercedes-Benz started building a development of a model sold in Turkey as the O.340 for the Western European market. This was this O.350 Tourismo and, since that time and the transfer of production to the Hosdere plant, it has become an increasingly important member of the Mercedes-Benz range. The initial design was facelifted in 1999 and the second generation model followed in 2006, bringing with it three-axle variants. A lower-height RH model joined the existing high floor RHD options in 2009, and in 2013, a shorter RH model known as the Tourismo K appeared. These lower-height options will continue in production as they are, but with additional structure to ensure they meet the forthcoming ECE R66.02 rollover requirements which become mandatory from the end of October this year. From the outset, the third generation Tourismo, like its predecessor built at Hosdere near Istanbul, will offer four variants and three length options. All are marginally longer than their predecessors with the additional length added within the front overhang where it has been used to enhance the entrance layout. All versions are marginally higher than currently at 3.68m high and are 2.53m wide with a front overhang of 2.89m. Rear overhangs are 3.315m on two-axle coaches and 2.785m on tri-axles. The shortest option is the 12.295m two-axle model which has a wheelbase of 6.09m. There are two 13.115m models, the Toursimo M/2 two-axle coach with a 6.91m wheelbase and the Tourismo M/3 tri-axle with a 6.09m/1.35m wheelbase. 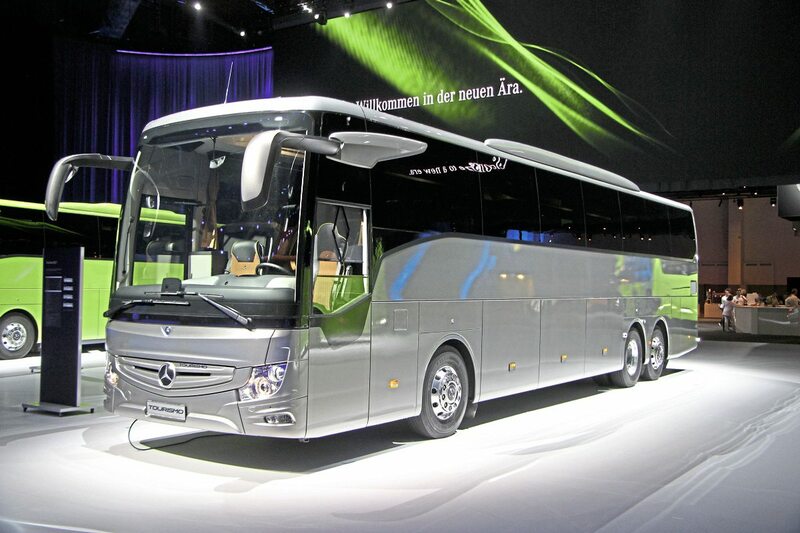 The longest option is the 13.935m Tourismo L which has a 6.91m/1.35m wheelbase. There is no 15m option. In appearance, the new generation Tourismo RHD is immediately recognisable as different, although it is not a radical styling departure from the look of its predecessor. They way Mercedes-Benz put it is that: ‘it takes the essential outline of its predecessor and interprets it anew for the present and the future.’ Though there are styling similarities, not a single body panel or piece of glass are carried over. 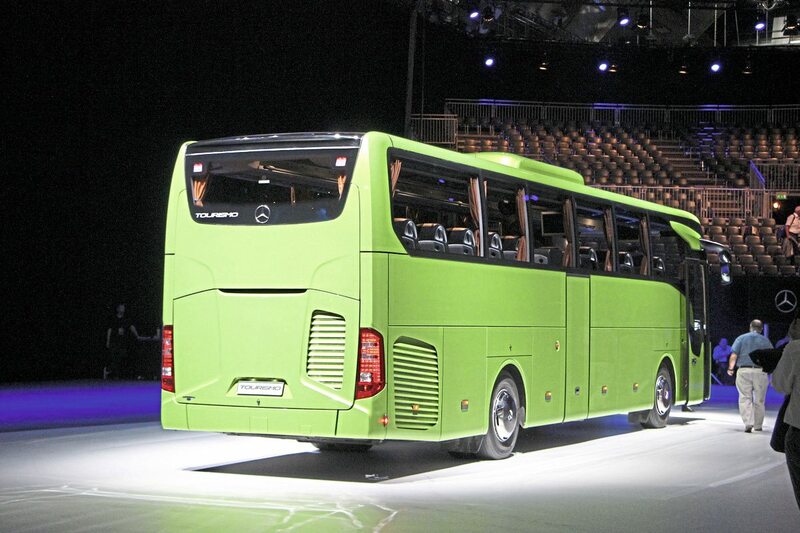 The structure, which Daimler representatives admit owes a great deal to the Setra ComfortClass range, is constructed in carbon steel. This is a higher grade of steel than previously used, making it stronger and able to achieve ECE R66.02 rollover regulations without using any more material, indeed the new coach is approximately 200kg lighter than the existing coach, yet it is stronger. As was previously the case, corrosion protection is achieved by cataphoretically dipping the entire structure. What the design team has been able to do is greatly improve the aerodynamic qualities of the coach by a variety of means including a more curved front, panelling beneath the front overhang, optimisation of the shape of the mirror arms, automatic lowering of the chassis by 20mm at 70kmh on motorways and optimising the rear styling with a break-away edge. This gives it a drag coefficient figure of only 0.33 which they pointed out was the same as that achieved by a Mercedes-Benz SLK sports car until a few years ago. All of these points help to reduce the total cost of ownership (TCO) of the Tourismo, something that was heavily promoted during the launch. Mechanically, there is little difference between the existing three-axle models and the new ones all of which will feature the six-cylinder, 10.7-litre, OM470 unit, save that a 456hp/335kW option is now offered in addition to the 360hp/265kW, 394hp/290kW and 428hp/315kW units. At 1,100rpm, these engines deliver peak torque of 1,700Nm, 1,900Nm, 2,100Nm and 2,200Nm in order of capacity. 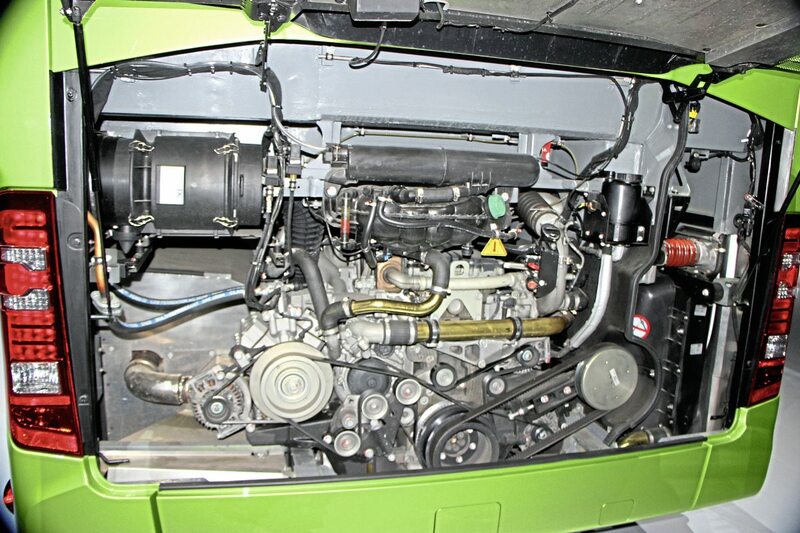 In both two-axle models the same OM470 options are offered but there is also the completely new alternative of the six-cylinder, 7.7-litre, OM936 which gives you 354hp/260kW and peak torque of 1,400Nm at 1,200-1,600rpm. The OM936 is around 250kg lighter than the OM470 as a package, partly because it has a single SCR system rather than the twin diesel oxidation catalysts, particulate filter traps and SCR cartridges of the OM470. 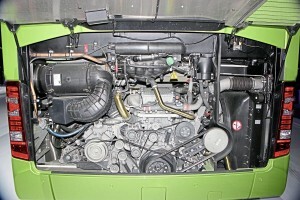 Both engines employ both SCR and EGR for emissions control. The cartridges are not interchangeable between the different engines because that in the OM936 is a longer single unit. In the past it had been possible to specify the 12.9-litre, OM471 engine in the Travego but this will not be possible in the Tourismo, although the new 456hp/335kW option delivers only 21hp/15kW less than the 476hp/350kW available with the OM471. Transmission choices are the Mercedes-Benz GO210 six-speed manual (with the option of the GO230 manual and, in two axle variants only, the GO190 manual, or optionally in all models, the GO-250-8 PowerShift eight-speed automated unit. ‘What – no fully-automatic option you ask?’ but don’t fret, because for right-hand drive markets only you can also have the ZF EcoLife fully automatic option in OM470 290hp/394kW equipped coaches. You can’t have the EcoLife with higher-rated OM470s because the torque would be too high, nor, for the time being at least, with the OM936 on which the GO250-8 is standard. I understand that the Mercedes-Benz engine department is working with ZF on a higher torque output for the EcoLife but this has not been signed off yet. On all variants the independently suspended front axle equipment is the ZF RL75E unit while the drive axle is the Mercedes-Benz RO440. Tri-axles have a ZF independently suspended trailing axle which is actively steered. ENR electronically levelled air suspension is standard as is a combined lift/lower mechanism. 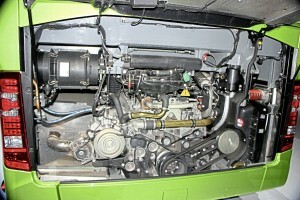 Steering is the ZF 8098 Servocom system. An electro-pneumatic braking system, the ESP electronic stability programme, a brake assist system, the DBL continuous braking limiter, ABS and ASR are all standard. Further safety systems are also detailed in this feature. European maximum permissible GVW figures for the Tourismo are 19,500kg on two-axle models and 24,000kg on tri-axles. Individual axle weight limits are 7,500kg on the front axle, 12,600kg on the drive axle and 5,750kg on the tag axle where applicable. Tyres are 295/80R22.5 on all axles on all models, with alloys standard on the M/2 only. I was not able to obtain full unladen weight details for every model but I understand that UK specification models with the OM470 unit have ULWs (including driver and part fuel load) of around 13.6 tonnes for the M/2 and around 13.2-13.3 tonnes for a 49 seater with toilet and servery. Total luggage capacity is approximately 9.9 m3 maximum in the 12.3m and 13.1m M/3 models and approximately 12m³ in the M/2 and L models. 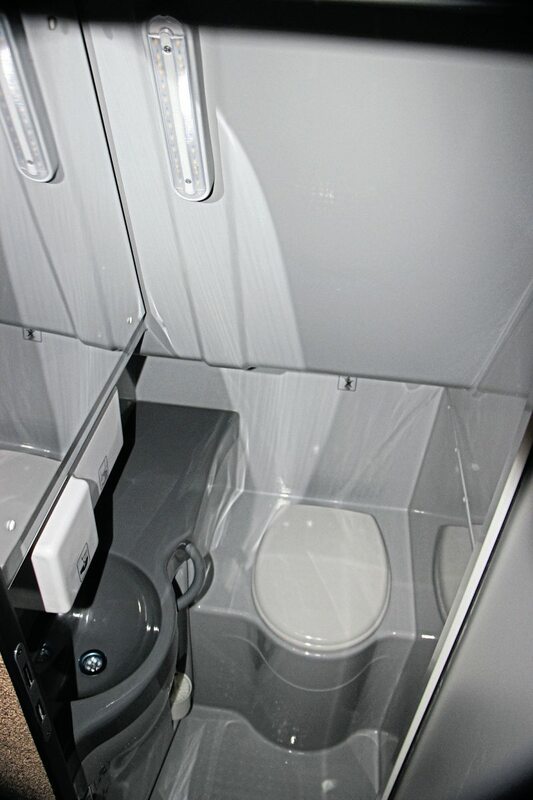 In all cases installing a toilet reduces this by 1.2m³ and a driver’s bunk would decrease it by a further 1.6m³. During the launch event, several different presentations were made on different aspects of the new product, one of which was on safety. There is a bewildering array of active and passive safety features on the Tourismo as standard with others available as options and their number has been increased on the new generation. Standard are: ABS, EBS, DBL, BAS, ESP, SPA and AEBS. Options are: ART, ABA3, TPM and AtAs (attention Assist). 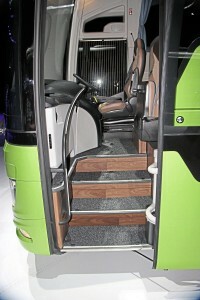 Enhancing passive safety is an upgraded version of the FCG (Front Collision Guard) beneath the front of the coach. This uses specially-designed steel types and construction to deform in a manner that pushes the driver’s seat out of the way of the impact in a head on collision as well as giving passengers added protection. If you drive a Mercedes-Benz car you may already be familiar with Attention Assist which monitors various aspects of driver behaviour and issues audible and visual warnings if it detects drowsiness in their responses. The separate Eco Driver Feedback (EDF) gives drivers advice on their driving with a view to reducing fuel usage. The Advanced Emergency Braking System or AEBS is a standard feature. Developed from the ART adaptive cruise control system, which slows the vehicle when its radar scanners detect the coach is travelling too close to a vehicle in front, AEBS is a three-stage programme that will ultimately apply full braking power in a potential collision scenario. different to that of a coach and its use was to do with time milestones in the development process and the importance of sustainability and reliability of the product. ABA4 would be offered as soon as it had been perfected for coaches. I’m not quite sure how it does it, but Stop/Start Assist is to help in stop-go traffic and there are also all of the many compulsory safety systems such as ASR, ABS and ESP, most of which were pioneered by Daimler companies. Rain light sensors bring the lights on in rain and a similar feature can also shut the roof hatches during a shower. are 150mm high. The Tourismo RHD always has a continental door and it is always located in the centre. 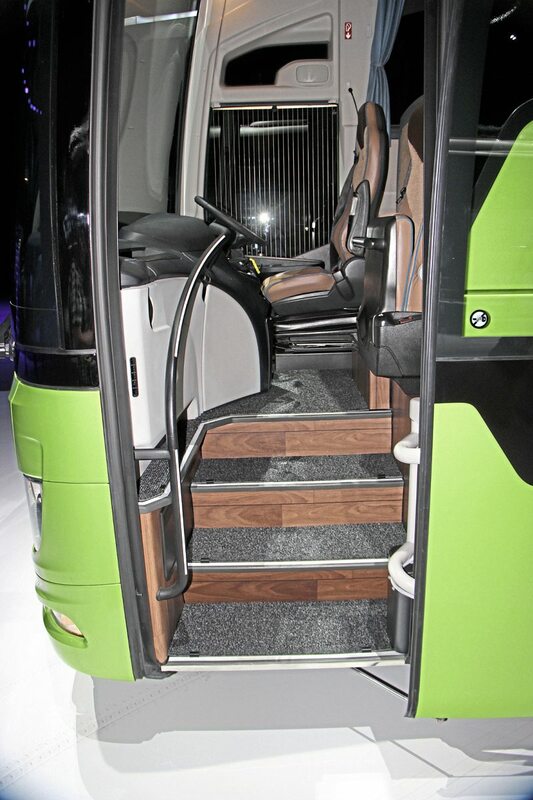 Within the saloon the full length racks are open, other than for lockable compartments at the front, and have a rail to the nearside on UK specification vehicles. Repositionable service units in black or optionally silver are mounted on the undersides. New colours have been adopted including one called ‘Greige’ a combination of grey and beige that is applied to the roof dome, racks interiors, rack ends and window pillar trims while the ceiling centre section is a light grey textile, though alternatives can be specified. The claim is that there is something for everyone in the choice of flooring and fabrics, including standard metallic and pebble looks as well as six different wood style floor finishes. 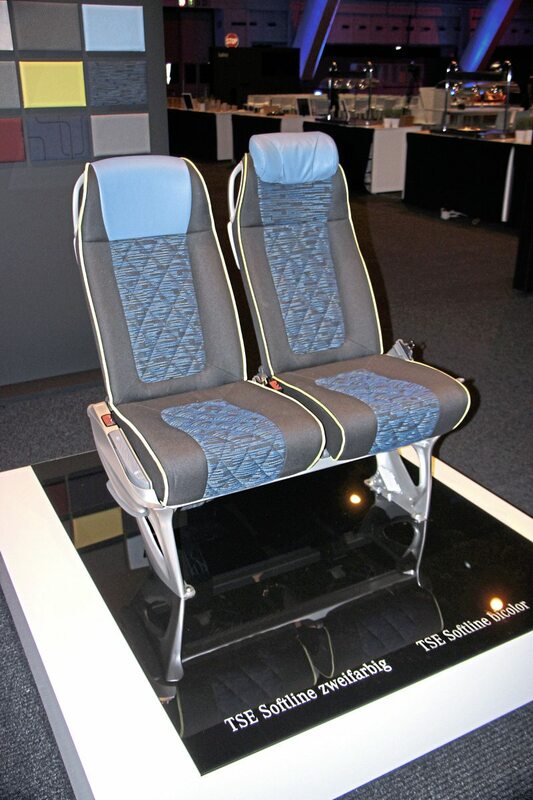 Carried over from the existing range is the Travel Star Eco seat, which remains the standard. The next level is the new Softline with its additional cushioning, fleece lining, quilted diamond pattern trim, Mercedes-Benz logo, optional piping and contoured backrest. Top of the range is the Luxline with even more cushioning and side pleats. All lighting is LED. There is also a range of equipment variants enabling the provision of all manner of entertainment, wifi connectivity and electrical appliance charging. Monitors, if specified, can be static or powered, that at the front being a 19-inch unit. Servery options are available including a tea-making facility and various larger units included a new galley designed to be installed opposite the centre toilet. The standard capacity of the new fully-automatic, dual-zone air conditioning system which has separate front and rear zones, is 32kW (35kW in L models), but there are options for capacities of up to 39kW. Incidentally, for those who want to disguise the roof-mounted pod, there are special side shrouds available which can be specified to match the body colour. Five vehicles were shown at the launch, consisting of one each of the model variants in left-hand drive and a right-hand drive example of the 12.3m two-axle. 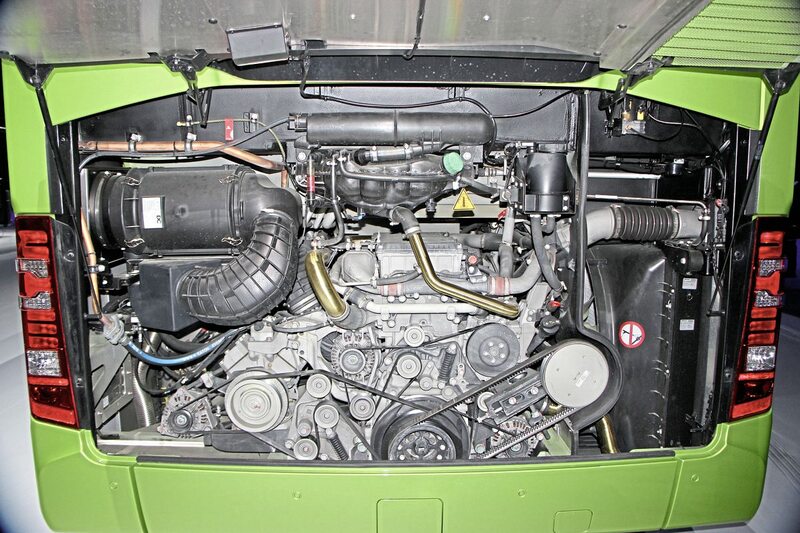 This coach was equipped with the 394hp/290kW versions of the 10.7-litre OM470 engine, the Mercedes-Benz GO250-8 Powershift transmission, a drive axle with a 3.583:1 ratio and was painted in an all-over Viper Green metallic paint scheme. Softline seating for 51 was fitted trimmed in tobacco Losanga edged in brown e-Leather with mocha e-Leather head sections that coordinated with the ‘Harmonia ship nature’ wood effect flooring. The ceiling centre panel was in ‘Ceramique Evo’ grey and the curtains were blue. There was a hot water boiler mounted on top of the centre sunken toilet compartment, a front fixed and two drop down monitors above the aisle, an audio system with seat-mounted headphone jack sockets and a Coach MediaRouter to provide an internet connection. Wall-mounted plug sockets at ankle level on the body sides provide power for charging telephones and other mobile electronic devices. Optional features include Active Brake Assist 3, Stop&Go Assist (along with adaptive cruise control), tyre pressure monitoring and Attention Assist as well as ADF (eco driver feedback). I understand that the list of interior layouts for the UK market exceeds 50 across the different models which is impressive and a step up from previous levels of flexibility. Not all have yet been fully signed off but the expectation is that the maximum capacities on each model will be 53 plus toilet or 55 without toilet in the 12.3m, 57 plus toilet and 59 without in the two 13.1m options and 61 plus toilet and 63 without in the 14m. There are also options with seats at tables and large serveries but you are best discussing these with the team from Coventry. 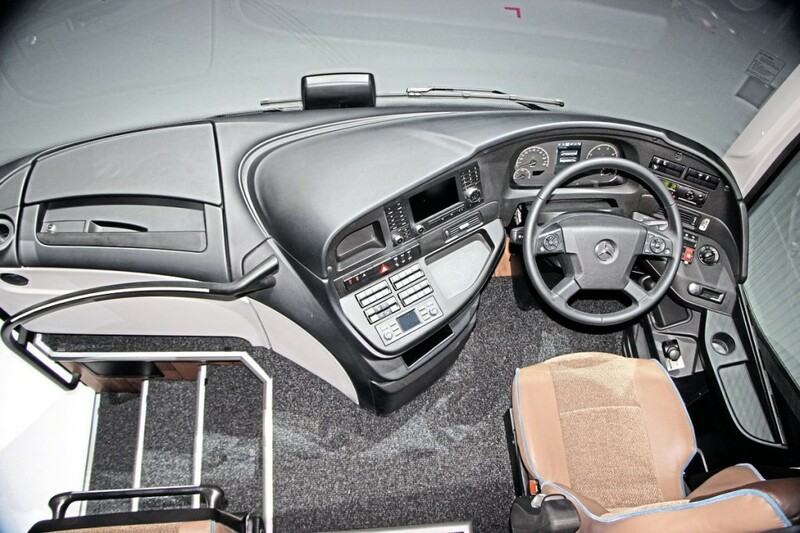 Left-hand drive models are being offered with a choice of two different cab treatments, both with multifunction steering wheels, known as Basic Plus (which includes pre-installation for a ticket machine) and Comfort Plus which is more of a touring specification with a silver ‘river’ edging band and a Coach Multimedia System. For the UK there will only be one design but don’t worry; to my mind it is probably preferable to either of the LHD options in both appearance and functionality. 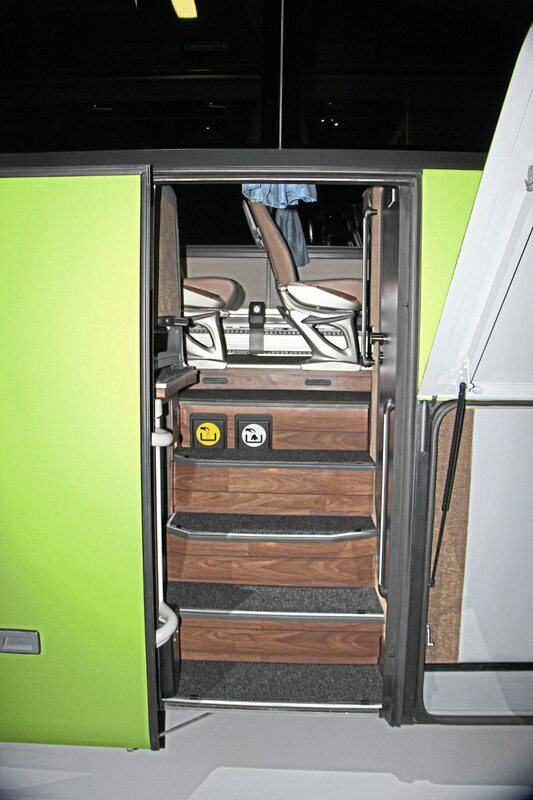 From the outset the new range has been designed so that each variant can house a wheelchair lift on the nearside. This would be mounted behind the locker door to the rear of the front axle and the flap itself would be horizontally split leaving the luggage compartment accessible. Positioning would be the same on both two- and three-axle models. The lift unit would be a new Hubner design first shown at last year’s IAA exhibition mounted on a Setra ComfortClass MD. 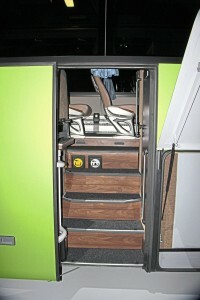 With the integral construction technique and the location of so many safety systems beneath the front it is not possible to install a step lift on the new Tourismo which may limit its UK appeal for express work. The Mercedes-Benz brand has never been stronger in the UK market and with more models and the ability to appeal to more sectors of the market it is hard to imagine that they will not further build upon their existing position. The proviso is that they continue to beef up the aftersales operation to cope with the increasing parc and ensure that operators across the country can get the service they require without waiting and without having to return the vehicle to Coventry. Talking to Michael Thielmann it was evident that addressing this requirement is high on his list of priorities to which end the existing mobile aftersales van fleet is being augmented to eight vehicles from the current four. In addition, emphasis on ensuring local commercial vehicle dealerships have the necessary coach skills is being stepped up; the Tourismo currently being used to homologate the vehicle for the UK is scheduled to be used to train dealerships locally once it has completed its current role. 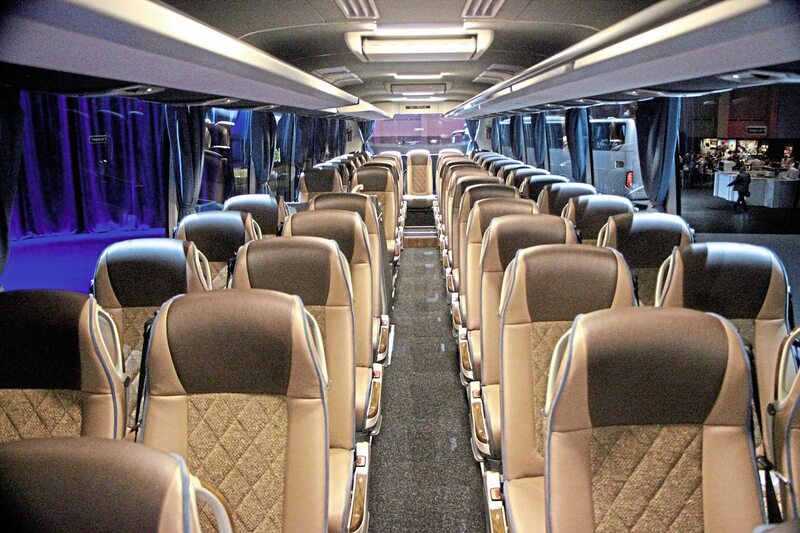 The current Tourismo is already taking a significant share of the UK coach market, though SMMT’s failure to produce proper figures any more makes it difficult to be too specific about exactly what that share is. In the past the three-pointed star has not really been a factor in the lower section of the full-sized new market, but with the smaller engine option I expect to see it looking to take on the Volvo B8R and similar products. Similarly, though the 14m sector is limited, Mercedes-Benz will be looking for a share of it. It will be interesting to see how having a two-axle and a three-axle in the 13.1m market will play out; I predict considerable interest in the two-axle model, providing it delivers on seating capacity, and though to some extent you could see this growth being at the expense of the 12.3m and the tri-axle, I’m pretty sure the overall sales trend will continue to increase. 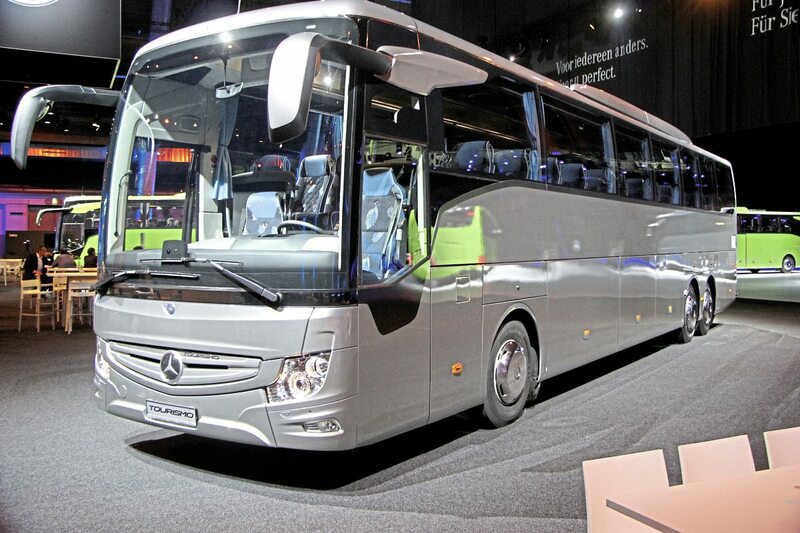 The first right-hand drive Tourismo will appear on the Mercedes-Benz stand at the Coach & Bus UK show at the NEC in October and deliveries this year are likely to be limited, with no more than twelve set to be delivered before the year end as the Hosdere plant in Turkey gears up to build the new model range. Some of the earliest vehicles will be demonstrators to enable existing and potential customers to get a feel for the new models. These are expected to go on the road during late November/December. For those who want to continue with the old model production will continue until October but will have to cease then because it does not satisfy ECE R66.02 rollover regulations. If you want one there will be stock examples to meet demand into next year, though if you want one to your own bespoke specification you only have around six weeks to order it. and I look forward to getting the opportunity to actually travel on one rather than inspecting stationary examples.